Everything’s better naked, and monsters are no exception. This recipe is much indebted to my mom’s monster cookie recipe, but i’ve made a few changes along the way. 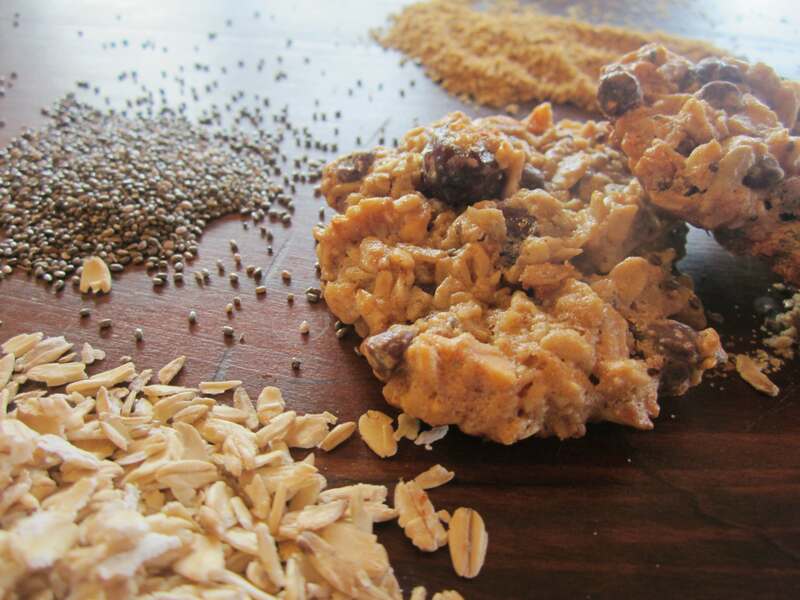 Some chia and flax for extra healthiness (although they’re not an obnoxiously healthy cookie…not to fear! ), the addition of some cranberries to complement the chocolate, and replacing the white sugar with a lesser amount of honey. This makes them a bit more particular to cook, as the honey needs a low temperature and careful cooking. Every oven’s temperature is a bit different, so try the first batch with just a few cookies until you get it right. The end result is worth it! Combine the chia seeds and water and let them soak together for about 10 minutes. Meanwhile, in a large mixing bowl, cream together the butter, peanut butter, honey, and brown sugar Add the eggs and vanilla, beating until smooth. In a small bowl, combine the Rolled Naked Oats, ground flax, and baking soda and then add to the butter mixture. Add the chia seed ‘gel’ into the dough, and then toss in your cranberries and chocolate chips. Stirring these up will be a bit of a work-out, so roll up your sleeves and dig in! If your eggs are extra large (or if you added an extra dollop of peanut butter for good luck) your dough will still be a bit goopy, so just add another half cup of oats to soak up the moisture. You can never add too many oats! These cookies spread out nicely as they cook, so just drop them by the spoonful onto a greased or non-stick pan and bake at 325° for 14-15 minutes. This recipe should leave you with about 6 dozen not-so-monsterous-sized cookies. The recipe can be cut in half if needed, but they also fare very well in the freezer, so don’t be afraid to make extras. I think we were raised on double batches…thanks mom!